10 x 14 in - 25 x 36 cm Watercolor This was a quick paint. Look at reference photo and paint with little thought. This is on a sheet of hot pressed paper that was stretched a while ago and I thought it was about time it got used up. Another attempt at Charles Reid style, no lifting the pencil, drawing. I am not as disciplined as I should be but I hardly ever resort to rubbing out and that is most of the battle. 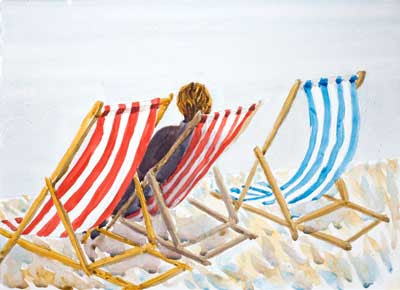 The deck chairs were painted with bold, mainly, single strokes. If you mess about HP paper will show those over-strokes oh so clearly . 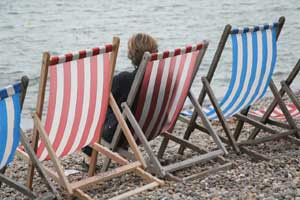 This was the ref taken on the beach of the village of Beer, Devon in September 2006.